Bizarre newt uses ribs as weapons: "One amphibian has evolved a bizarre and gruesome defence mechanism to protect itself against predators. 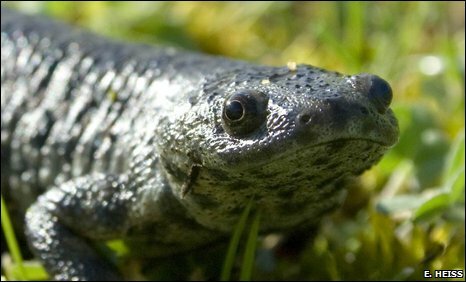 When attacked, the Spanish ribbed newt pushes out its ribs until they pierce through its body, exposing a row of bones that act like poisonous barbs. The newt has to force its bones through its skin every time it is attacked, say scientists who have described the form and function of the barbs in detail. Yet this bizarre behaviour appears not to cause the newt any ill effects."